Table 1: projected average changes in temperature and precipitation for the Pacific Northwest. Changes are relative to 1970‐1999, for both medium (A1B, 20 models) and low (B1, 19 models). Global average temperatures have increased by approximately 0.7 °C and precipitation patterns have significantly changed. These trends will likely continue throughout the next century1. In the Pacific Northwest temperatures have increased by about 0.8 °C and models project warming of 1.8°C by the 2040s and 3.0°C by the 2080s (see Table 1)2. Precipitation is also projected to change, with general increases projected for the Pacific Northwest, and with a more intense seasonal precipitation cycle ‐ autumns and winters may in fact become wetter and summers may become drier. Further, regional climate models indicate that extreme precipitation in western WA will increase and the snowpack in the Cascades will decrease. Although the trend in direction of change is broadly recognized, there is uncertainty associated with what actual extent of changes may occur through time and in local areas. The effects of climate change and increased climatic variability have already been documented for many Pacific Northwest systems, from high elevation forests to coastal wetlands. Additionally, some of the region’s most significant ecological driving forces, such as fire, extreme precipitation and the length of the summer dry period will likely intensify leading to substantial changes. These changes will have cascading effects on the ecological systems that the region relies on for water regulation and quality, agriculture, timber, and ecological integrity. We are already seeing some of these changes, such as shifts in the timing of ecological events and the distribution of species 3. Phenological changes including earlier flowering, egglaying, and the timing of migration can lead to cascading ecological effects, including rapid population declines4. Many of these changes are considered to be negative because they happen more quickly and more broadly than natural systems are adapted to handle and remain reasonably stable with respect to human interests. Resource managers already have many of the tools they will need to address climate change, such as reducing non‐climatic stressors like exotic and invasive species, providing adequate and appropriate space and removing barriers to dispersal, restoring key habitats, and applying adaptive management. However, although these tools can enhance the resilience of natural systems to climate change, knowing which species and habitats are most vulnerable and hence where to direct limited resources is a key first step. Figure 1. 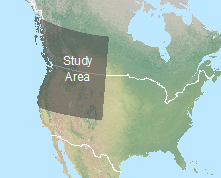 The Pacific Northwest Climate Change Vulnerability Assessment study area. The University of Washington has partnered with key collaborators in the region to conduct a climate‐ecological vulnerability assessment. This assessment is designed to evaluate the relative vulnerability of the species and ecological systems of the Pacific Northwest to climate change. The assessment covers an area that extends beyond the borders of Washington, Oregon, and Idaho (see Figure 1) and involves scientists, natural resource managers, and conservation planners. The project will develop a digital database of inherent climate‐change sensitivities for species and habitats of concern throughout the Pacific Northwest and will promote convenient analysis and illustration of possible effects at various landscape scales. These tools and improved insights will provide resource managers and decision makers with some of the most basic and most important information about how species and systems will likely respond to climate change. It also will allow researchers to answer important scientific questions regarding the potential impacts of climate change on natural resources. All components of this collaborative work make important contributions to understanding the effects of future climate change on the species and habitats of the Pacific Northwest. The database assesses the sensitivity of the Pacific Northwest’s conservation targets to climatic changes. Analyses of the simulated climate and vegetation changes provide an indication of the potential magnitude and spatial character of future climate change and its impact on vegetation. Simulated changes in species and habitat distributions interpreted from ecological models will reveal how climate change can and may affect future occurrence of species in the region. Ultimately, this investigation will integrate these results and produce an assessment of the vulnerability to climate change of species and systems in the Pacific Northwest. We will describe and assign a level of uncertainty to the projected changes and, we will work with conservation scientists to produce documentation, analyses, and visual displays of data that will be useful by resource managers for developing management and planning responses to climate change impacts. This project is a collaboration among researchers, managers, and planners at the University of Washington, U.S. Geological Survey, The Nature Conservancy, the National Parks Service, the U.S. Forest Service, the Washington Department of Fish and Wildlife, the University of Idaho, the National Wildlife Federation, the Oregon Department of Fish and Wildlife, Idaho Fish and Game, the Great Northern LCC, and the North Pacific Landscape Conservation Cooperative. 3 Walther et al, 2002. Ecological responses to recent climate change. Nature 416:389‐395; Parmesan and Yohe, 2003. A globally coherent fingerprint of climate change impacts across natural systems. Nature 421:37‐42. ; Root et al, 2003. Fingerprints of global warming on wild animals and plants. Nature 421:57‐60; Parmesan, 2006. Ecological and evolutionary responses to recent climate change. Annual Review of Ecology, Evolution, and Systematics 37:637‐669. 4 Walther, 2002. Ecological responses to recent climate change. Nature 416:389‐395.